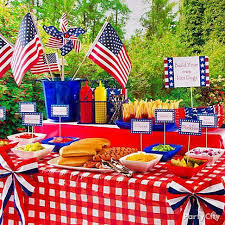 The basics: July 4th is all about the barbecue, burgers, sandwiches and potato chips. Mix these foods with the desserts, cola beverages and ice cream, and you have ample sugar that will rapidly increase your waistline. So start by avoiding white bread, stick to whole wheat bread and limit the amount of oil and use unsaturated oils for cooking. Grilled meats: There is no question that grilled meats are loaded with oil and calories. The first thing to do is trim off all the skin and fat before you cook the meat. Choose the leanest cut of meat and avoid adding too much butter or oil during the grilling. Choose options lower in saturated fat like skinless chicken breast or fish. Use a smaller plate and plastic utensils. One great strategy to limit your intake of all the delicious foods is to practice portion control. Start with a small plate and use plastic forks and knives –this can be quite irritating when trying to cut slices of steak but it will help you eat smaller portions. Pile up on the veggies: Before you fill your plate with any meat, add the veggies and non-meat products. These foods not only give you fiber and other valuable nutrients, but are also low in calories. Then fill the plate with meat in the little space remaining. Don’t skip breakfast: Most people wait to feast on the delicious foods on July 4th and they do this by skipping breakfast. In order to avoid over eating, do not skip breakfast. The old saying that it is the most important meal of the day remains true. Add physical activity. Since we place a high emphasis on food during this holiday, avoid increasing the waistline by making sure you add some type of physical activity before and after the meal. This can include swimming, any type of ball game, walking, bike riding or some type of relay activity. Include the kids in these activities! Eat slowly and enjoy the food instead of gulping it down. The more chatting you do, the less likely it is that you will overeat. If you have hunger pangs, skip the fast foods like potato chips, garlic bread, and colas; instead snack on the veggies. Unsweetened desserts. On July 4th, it is the desserts that add the extra calories. So stick to a small dessert and preferably something that is less sweet- like fruit or low-fat yogurt. Limit the alcohol: Remember most alcohol adds unnecessary calories. A glass of beer or a margarita will quickly add 300 calories, so limit the amount of alcohol intake. Try drinking a glass of water for every drink you have. Remember: Just because it is July 4th doesn’t mean you should get a pass on your dietary plans or exercise. Remember, it is easy to add hundreds of unwanted calories in one meal during this holiday but it can take you a week or even a month to get rid of the excess calories.